Trincomalee on the island’s north-east is regarded as one of the world’s largest natural harbours and with a rich cultural heritage, its famous white sandy beaches and serene turquoise blue waters and is increasingly becoming a popular option for those seeking a beach stay on the east coast. ‘Trinco’ has been used by the island’s major port going as far back as the Polonnaruwa era around two thousand years ago having attracted the Danish, Dutch, Portuguese, French and British and was even bombed by the Japanese in 1942 during WWII. One of the most popular sites to visit in Trincomalee is Fort Fredrick which lies on Swami Rock, which was originally built by the Portuguese in 1627 and restored by the Dutch in 1665. At its summit lies the sacred Koneswaram Hindu Temple which was fully restored in 1632 after the original temple was which was believed to be over 2500 years old destroyed by the Portuguese and was toppled over the edge of Swami Rock into the sea. Koneswaram is one of the five most sacred Shaivite sites in the island. Adjacent to the Koneswaram Temple is the Lovers Leap viewpoint where you can get sweeping views from the summit of Swami Rock over the Trincomalee harbour and its coastline where if opportunity permits, you have the chance to spot a Blue Whale. A number of Marine Excursions are also on offer at Trincomalee including snorkeling, scuba diving, deep sea fishing along with whale and dolphin watching. 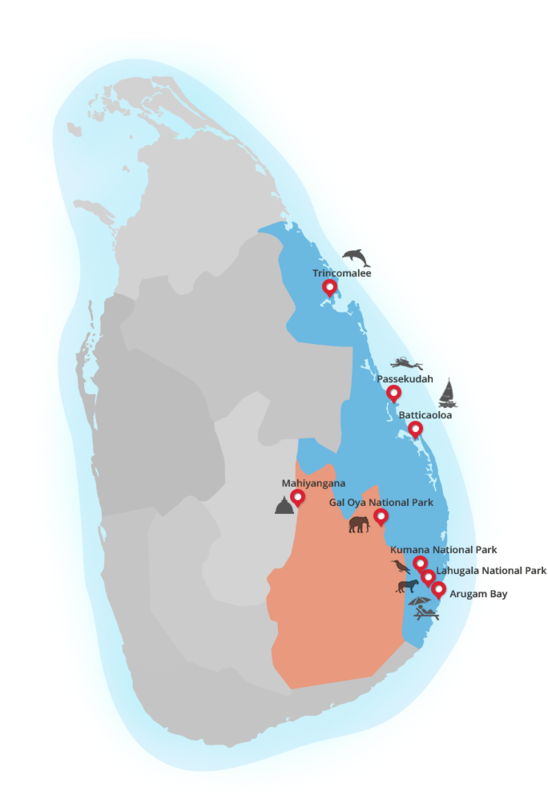 The area around Kalmunai and Trincomalee has over 20 different dive sites including a variety of deep drive sites with coral reefs in excellent condition. There are also a number of ship wreck sites including world war II ship wrecks with two deep dive sites in Kalmunai. Certified Dive Operators are based at Nilaveli and in the leading beach resorts. Trincomalee also has an expansive area of shallow fringing coral reefs in the area off Dutch Bay. The Pigeon Island Marine Sanctuary off Nilaveli remains the most popular option for snorkeling in the area. Deriving its name from the Rock Pigeon which has colonized the island in large numbers, Pigeon Island contains some of the best preserved coral reefs in Sri Lanka. Close to 100 species of coral, 300 coral reef fish species along with Hawksbill Turtle, Green Turtle and Olive Ridley may be encountered here. Along with Mirissa in the south, Trincomalee on the east coast is the island’s other established location for whale watching the Blue Whale. The deep waters around Trincomalee’s natural harbour can often result in the Blues coming very close to shore and are occasionally seen from the land from a viewpoint at Swami Rock. The sightings of Blue Whales and pods of Sperm Whales off Trincomalee peak from March through to April. The Blue Whales however are resident around Sri Lankan waters and chance encounters are possible during other months. Large pods of Spinner Dolphins in their hundreds are encountered on most days during this period. Orca, Bryde’s Whale, Risso’s Dolphin and Short-finned Pilot Whale maybe encountered during an Oceanic Safari. The whale and dolphin watching excursions run from March through to September when the north-east monsoon is inactive. Lying inland from Uppuveli are the Hot Springs at Kanniya, which is a sacred site for Hindus, who visit from all parts of the island to perform religious rites after the passing away of a family member. There are seven wells, where the temperatures of the waters vary from well to well ranging from 29c – 46c. It is believed that the hot springs were created by Lord Vishnu and named after the mother of the demon king Ravana to enable Vishnu to perform an ablutionary rite on his mother. Trincomalee, which was under the rule of the British during World War II when it was bombed by the Japanese in 1942 along with several Australian and British ships in the area. There are 362 graves of the servicemen who lost their lives on duty during World War II at the Commonwealth War Cemetery. The Cemetery lies off the main road in Uppuveli and visiting hours are from 7:00am to 6:00pm. This is one of six Commonwealth war cemeteries in Sri Lanka.